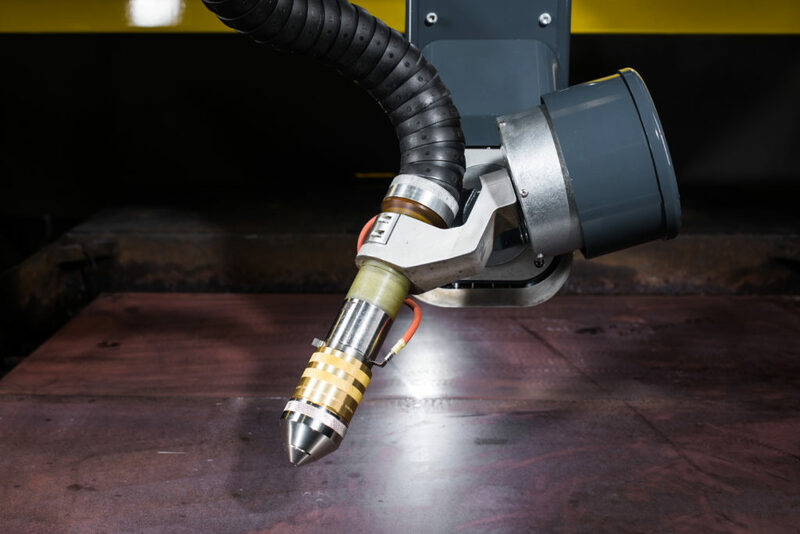 Plasma bevel cutting with has become increasingly common over the last few decades. 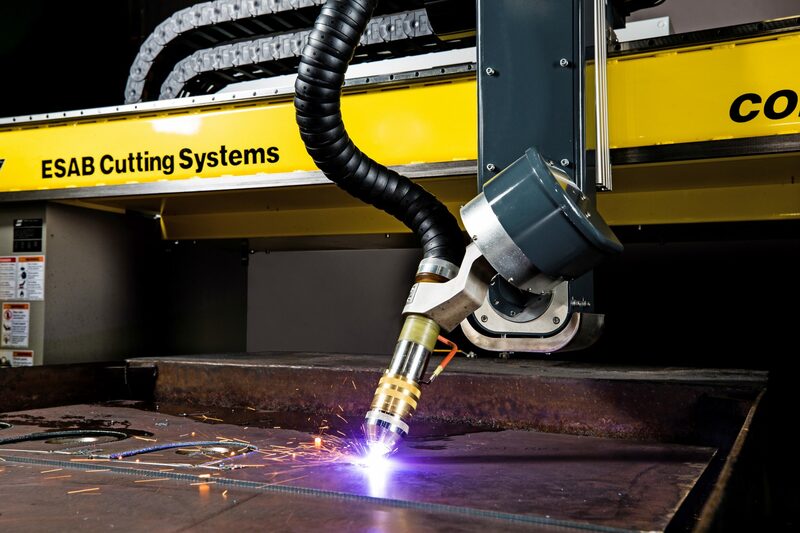 Dozens of suppliers offer plasma beveling capability as an optional feature on thermal cutting machines, in all different shapes and sizes. In the 1990s, there was only a handful of suppliers with the engineering power and process knowledge required to deliver such a complex system, and prices usually started in the neighborhood of $350K to $500K for a complete machine installation. In today’s market, you can find plasma beveling solutions for less than half of that. The barriers to entry have come down, allowing a plethora of choices when it comes to plasma beveling. However, one common problem that all machine builders must address is the issue of bevel motion. Plasma bevel heads require fast, accurate motion in five axes. There are many ways to accomplish this, but most are big, heavy, and complex systems. Examples include rotating protractors, compound skew systems, and hybrid rotary systems (which combine a rotation axis with another type of tilt axis). Each of these arrangements feature a large rotating mass that must be supported and moved accurately over large working areas. Both reliability and cost can often be traced to complexity. Complexity is driven up by the large number of components required to provide both tilt and rotation motion while accommodating a plasma torch, crash protection system, and initial height sensing system. Drive train components often include a motor, pulleys, belts, gearboxes, ring gears, pinions, encoders or other feedback devices, limit switches, and cams. In addition to the drive train in each axis, there can be torch bearings, crash protection devices, and initial height sensing devices. As the number of components in a system increases, the reliability of the system decreases. Torch motion also impacts reliability. When a bevel system rotates, the torch leads are twisted. To avoid over-twisting the torch leads, manufacturers have resorted to several common designs, including rotation limits, torch bearings, or slip rings. Some use a torch bearing, which allows the torch to rotate freely along its axis while being manipulated by the bevel head around a tool center-point. Allowing the torch to spin within a bearing solves the problem of twisting the torch leads but adds cost, complexity, and a small measure of inaccuracy. Slip rings can also be used to avoid rotation limits. Electrical slip rings can pass all the plasma signals and current from the stationary part to the rotating part of a bevel head, while a gas union allows the fluids to pass. Unfortunately, these systems add significant cost, complexity, weight, and size to bevel heads. A small number of manufacturers have started using parallelogram arrangements. These have the advantage of eliminating the rotation device, but they replace it with a complex system of joints and linkages which, when pushed by a pair of sliding drive mechanisms, will provide torch motion in 3 axes. The main problem with parallelogram-type bevel systems is that they must be in close proximity to the cutting surface, where they are exposed to damaging pierce spatter and easily crash into tipped parts. Also, to achieve the required accuracy, they require many precision-machined parts and joints, which drives up the cost. Exposed hoses, cables, and torch leads are easily burned by heat and ejected molten pierce spatter. Mechanical components can become fouled with pierce spatter, water, or soot. Avoiding costly downtime and repairs requires protection of all hoses, cables, and sensitive mechanical components against these elements. Plasma torches often experience torch collisions during normal operating sequences. Torches can bump into tipped up parts, slag puddles, or other inadvertent obstacles left in the torch path when cutting. In addition, the protruding plasma torch is exposed to collisions with table walls when cutting over a water bed. 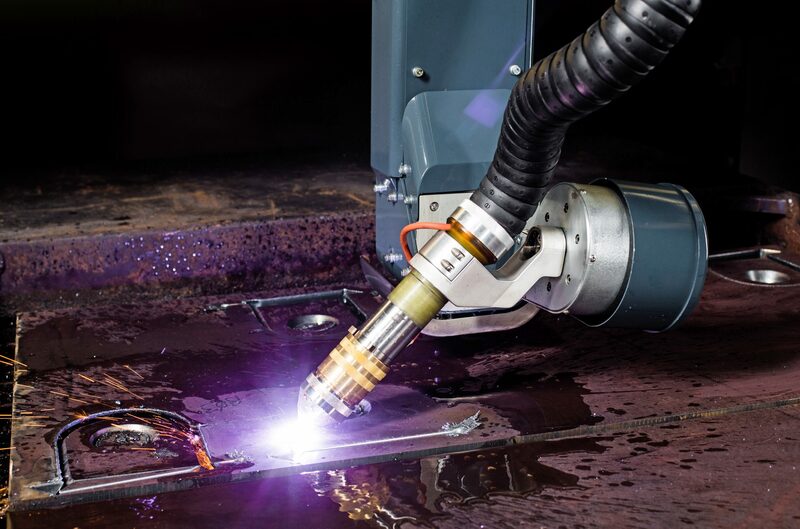 The problem is that protecting against plasma torch collisions while maintaining accuracy and reliability is difficult and brings with it both safety and productivity considerations. There are two primary methods of torch collision protection: breakaway and spring-loaded. Breakaway devices are quite popular and protect the torch by releasing the torch holder from the bevel head in the case of a collision. Spring-loaded devices come in a variety of designs but basically provide the same function: they allow the torch to move during a collision but then spring back into position when the obstruction is cleared. Both methods introduce some measure of inaccuracy and will never actually re-seat in exactly the same location. While this is often tolerable when cutting straight (non-beveled) parts, the inaccuracy induced at the tool center point when beveling is often unacceptable. In fact, some manufacturers recommend the operator conduct a bevel head alignment procedure any time the torch is crashed! Both systems also add complexity and cost to any bevel head, which must also be factored into the overall reliability of the system. However, breakaway-type devices introduce a safety concern that must be considered. Any time a torch breakaway releases during cutting operations, the disconnected torch must be manually reset back into position. 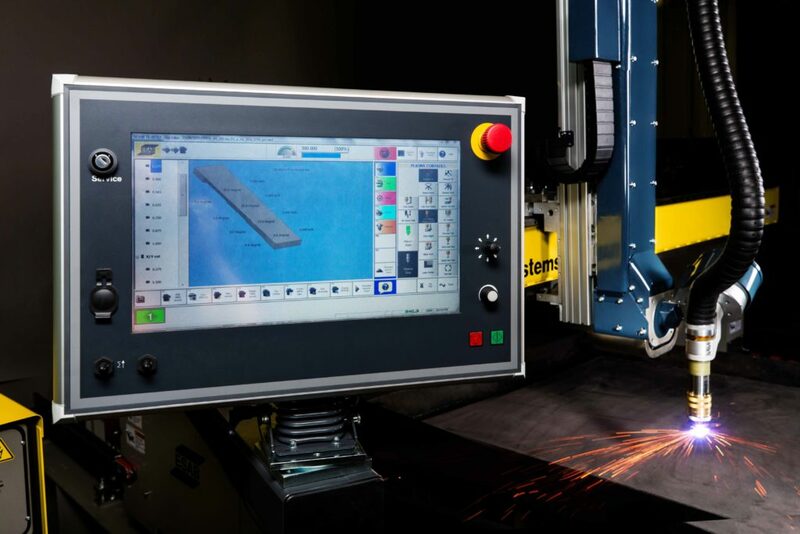 Depending on the size of the cutting table and where on the table the collision occurs, a manual reset may require the operator to climb onto the table to reach the torch. Cutting tables are designed to support plates, not people. These uneven surfaces and partially cut plates expose the operator to fall, trip, cut, abrasion, pinch-point, burn, and electrical hazards – all of which can be serious or even fatal. In addition, with a breakaway device, regardless of whether the operator climbs onto the table or just reaches over while standing on the floor, the operator still must physically touch the plasma torch to reset the collision. This also represents a safety hazard, as most plasma system manufacturers recommend disconnecting plasma system power before touching the torch. Few operators will do this, as it adds time and inconvenience. Productivity is also impacted more by breakaway devices, because manual resetting of the torch takes longer, causing more downtime than a spring-loaded device, which resets automatically. ESAB’s DMX Technology creates an extremely simple mechanical design, eliminating almost all of the weight and complexity of older bevel head designs. ESAB’s DMX Automated Plasma Beveller is similar to many other new generation plasma bevel heads. It uses two rotary axes to provide torch motion for beveling in any direction. However, by incorporating the latest in direct drive technology, the new Direct Multi aXis system (DMX) eliminates the need for gearboxes, belts, pulleys, and limit switches. The result is a very compact bevel head with radically reduced complexity, resulting in higher reliability. DMX provides all the benefits of a compound motion system but does it with fewer parts and extremely accurate torch positioning. Motor motion is coupled directly to the torch and is extremely accurate. The motion system’s internal absolute encoder provides resolution better than 1/1000 of a degree in each axis, resulting in axis accuracy of +/-0.004 degrees. Cables, hoses, and torch leads are all fully protected on DMX. A Complete Cable Protection System includes a full set of metal covers, a robotic sheath for the torch leads, and a fully enclosed cable chain for the Z-axis. In addition, the direct drive system provides a unique through-the-motor cable design which eliminates external cables to the pitch motor. Another important benefit of DMX Technology is Motion Compliance, which allows the torch to easily absorb a crash without damage, and automatically resets the torch without manual intervention. DMX requires no breakaway, spring-loaded, or robotic collision sensor. Because the direct drive motors are coupled directly to the torch mount, the DMX bevel head features “Motion Compliance,” which is the ability to back-drive the motors. Motion Compliance permits a pre-determined amount of motion in each axis before axis position error triggers a torch collision. When the system senses a torch collision, it disables the motors, allowing them to go limp, which prevents damage. After the collision is cleared and the system reset, absolute position encoders enable the motors return to their exact position. The torch automatically resets in a matter of seconds, and it does so without manual intervention. As a result, DMX Technology improves safety and productivity while reducing complexity and cost. ESAB Cutting Systems is a global supplier of thermal CNC shape cutting machines. With manufacturing facilities in the U.S.A., Germany, India, China, and Brazil, ESAB can meet the global demand for high quality, integrated CNC machines, and the after-sales parts and service to back them up throughout the product life. For more information, visit www.esab.com.